Another guest post written by Barbara, a fellow researcher at the Wilmette Family History Center. This time she shares information about searching indigent burial records. My cousin and I have been trying to track down my “Prodigal Grandmother” for over a year now but have had no luck. Information from her step-niece seemed to indicate that she was quite poor and might have died indigent in Cook County. Through searching the internet I discovered that Cook buried their indigent at Oak Forest Cemetery on the grounds of Oak Forest Hospital. There are no visible grave markers there to indicate where the indigent are buried but there is microfilmed information on who was buried in the cemetery and where. The South Suburban Genealogical and Historical Society (www.ssghs.org) has a large room in a public building in Hazel Crest and they house the microfilmed records of the infants and adults who were buried by the County from 1911 until 1971. After 1971 the indigent were buried in Homewood. I have learned a lot from conversations with other researchers and recently a patron at the Wilmette Family History Center told me how she found a birth name for her father who was adopted in 1927. The resource she used was new to me and I was intrigued. I thought others might benefit from her experience and so I asked her to write a guest post for my blog. She graciously agreed and you’ll find her contribution below. My sincere thanks to Barbara, the author of this guest post. Unknown to most adopted people and their families, there is a record that can be easily accessed that will give the birth name of the child given up for adoption in the majority of cases: the Chicago Daily Law Bulletin (CDLB). Adoptions are legalized through the county level of the court system and the petitions to adopt are posted in the CDLB and list the adoptive parents and the infant or child they wish to adopt. The Rinn Law Library of DePaul University on 25 E. Jackson in Chicago has all of the CDLBs on microfilm and, most importantly, THESE RECORDS ARE PART OF THE PUBLIC DOMAIN AND CAN BE ACCESSED BY ANYONE! The library is located on the 5th floor and the microfilms are kept behind the check in desk. The CDLB is very organized and the section where the petitions are listed is usually on page 3 or 4 under “New Cases” for County Court, which always falls after the Superior Court listings and before the Probate Court ones. Since the CDLB is published daily there are only 6 to 10 pages at most so one can search through a lot of records relatively quickly. 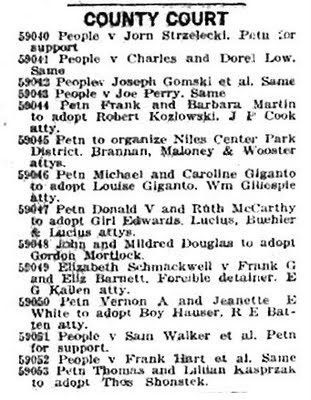 My own successful search for the birth name of my father, who was adopted as infant in 1927, took a scant few hours and some of that time was wasted in looking through the Legal Notices sections for Adoption Notices. The only time adoptive parents post an Adoption Notice is when the biological father or family of the child has not consented to the adoption, or the infant’s identity was truly unknown (i.e., a foundling). The other mistake I made was in looking in the CDLB issues that were published less than 6 months after the birth of my father -- the child has to have been living in the adoptive household for a minimum of 6 months before they can petition to adopt. I found his petition was filed almost exactly 7 months after his birth so it is a strong possibility that he may have been 1 month old at the time of his surrender to my grandparents. Once you have the birth name you can look for the birth mother in other documents, e.g. census data, birth indexes (for the mother’s name), etc. For those whose adoptions took place in other counties or states I recommend contacting Melisha Mitchell, founder of the White Oak Foundation (www.whiteoakfoundation.org). Melisha is a great resource and passionate advocate for adoptees and their families. It was she who told me where to find these records and of the 6 month waiting limit. Her website is chock-full of information and has many links to other resources as well. Two blog posts in one day. I’m on a roll. And no, I haven’t done a bit of housework but I did shower. That counts for something. So, a little background to start. I’ve been doing lookups for about five years and people are always asking me, “Do you know how I can find someone who does what you do in … ” You name the state or country. And my answer has always been, “No.” And people have also asked to pick my brain about how they might offer lookups like I do as a way of earning a bit of extra income. The site is a work in progress and we are still testing and tweaking, but it works! It makes ordering and offering lookups pretty simple and we’re excited about the possibilities that it offers to both “providers” and “clients.” If enough researchers embrace it, it will make it easy to find lookup help in many areas of the country and world and it will make it easy to offer lookups to those who need them. So why am I writing about this today? 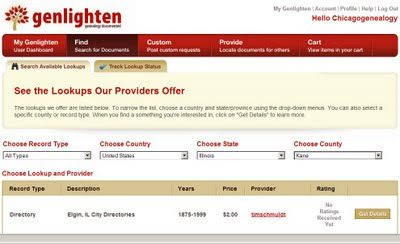 Well, it just so happens that one of the providers currently on Genlighten offers lookups in Kane County, Illinois and it just so happens that I am researching a few families who lived there. 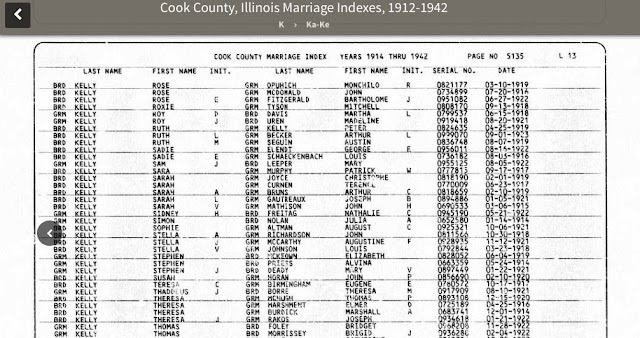 I just picked out two death record entries from the Illinois Statewide Death Index and a marriage entry from Elgin's Gail Borden Library's Local Newspaper Index and sent them off to a researcher who will now retrieve the matching records and upload the scans to Genlighten for me. Today I’m wearing the same shoes that those of you who send me requests wear and it’s fun! I’m looking forward to getting those records as much as I think someone of you look forward to hearing from me. And, yes, I’m itching to order a few more things that I think will be of interest. If those of you who try the Genlighten site have the same kind experience that I just had, well, I think we might have something there. Last week I received a request from a researcher who had an urgent need for information from a death record so that she could prepare for an upcoming trip to Chicago. I told her I thought I could help and that I would have the record for her the next day. Unfortunately, when I got home from the Family History Center I discovered that I had scanned the wrong certificate. It’s an easy mistake to make and it doesn’t happen often, but it does happen. I locate records using a regular microfilm reader and then I transfer the film to my scanner where I peer through a tiny magnifying glass to move the right frame into the scanning window. Sometimes it’s easy to misread the numbers. So, having made a promise, I went back to the FHC to get the correct record. And it’s here that the story begins. I noticed that the child died of diphtheria and I remembered that the record that I had scanned by mistake had been for a child of the same surname so almost without thinking I moved the film one record forward to take a look. The next certificate was for a child who died of the same disease at the same address. Very likely a sibling. And the next record was for yet another child. Same disease, same address. Within the space nine days in the summer of 1894 this family lost three young children, ages 3, 5, and 8, to diphtheria. I felt a deep sense of grief as stood by the reader. But I felt something else, too. I felt as if those children had wanted to be found. And I learned later that the researcher had been looking for members of this family for fourteen years. A lot of times people people say, “Oh, you’re so good at finding death records” and it’s true that my experiences over the last few years have taught me a lot about how to search. But I can take no credit for this find. I think it was supposed to be and I think that I was simply the one given the privilege of making it happen. How lucky I am to have a job with perks like that.